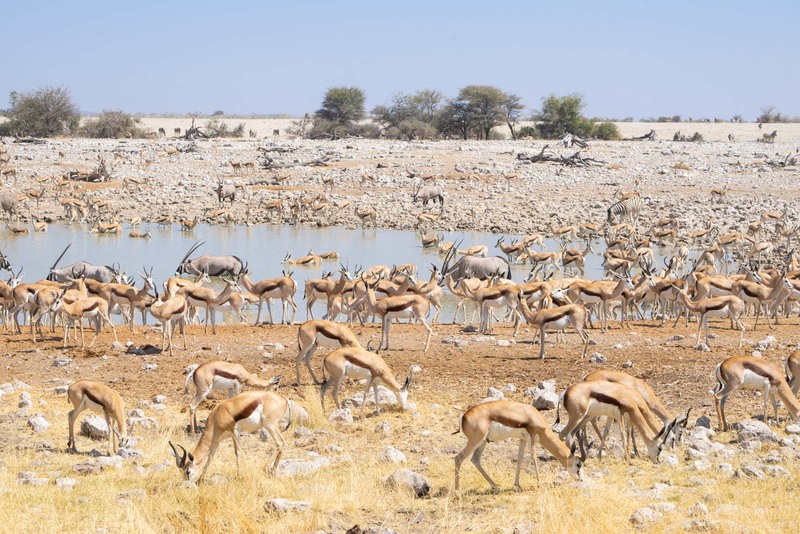 Every day, the animals here on the dry savannah of Namibia have to make the journey to a waterhole in order to survive. But it’s also the daily action that puts their survival most at risk. Predators know that their prey must come to one of these waterholes. For a lion, it’s easy to just wait near the water for your daily meal to come along. It means that each species that comes down for a drink has its own defence measures to reduce the chance of becoming dinner for the lions. And the most vulnerable animals are overly cautious, on the verge of paranoia. 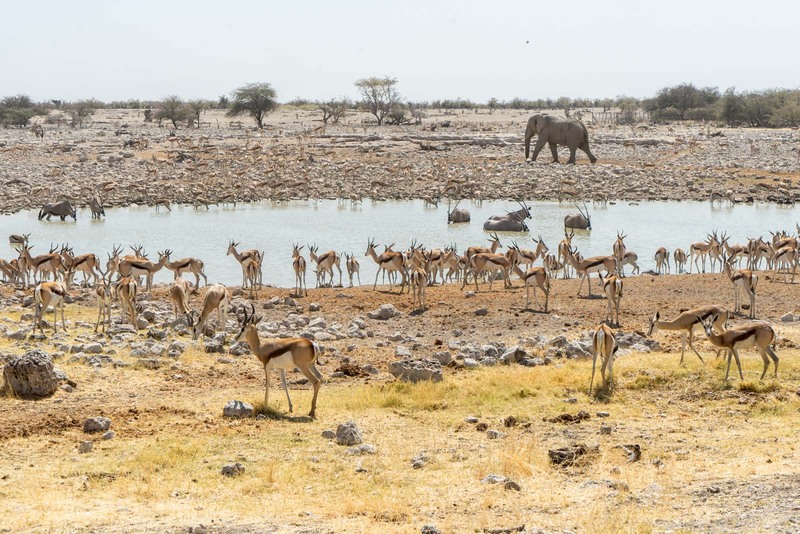 Watching all of this play out during my time at Namibia’s Etosha National Park… Well, it’s the most fascinating part of the whole experience and comes to define my understanding of Namibia’s wildlife. 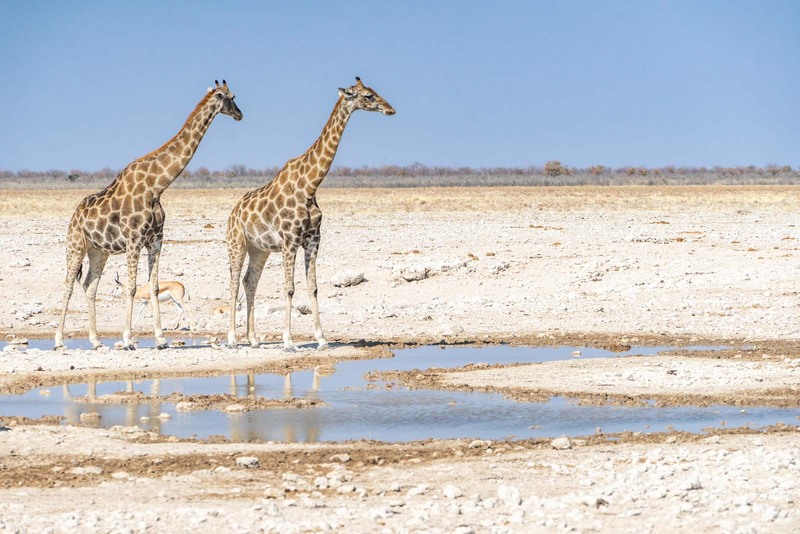 Here’s how it appears to work at the waterholes in Etosha National Park. When the lions come, anything that considers itself as prey will stay far away. These beautiful grand cats pretty much get to drink by themselves. But once the lions go, the other animals start to arrive. The zebras take the ‘safety in numbers’ approach to their defences. They arrive in a huge herd – hundreds of them – that have made their way for kilometres across the dry land. You can see the trail of them coming from far away, as they stir up the dust. Springboks take a similar approach and also come in a big group… although not quite as large as the zebras. But springboks are smaller and are not as confident to fight off predators. So they are nervous as they drink, constantly looking around. I see a moment when one of them gets scared by a movement in the distance and starts to run, and all the others instinctively follow. Although it’s a false alarm, they take no chances when their lives are at stake. The giraffes are the most cautious of them all. Although they are obviously large animals and probably could put up quite a good fight, they have a strange quirk to the way they drink. To get their mouths at the end of their long necks down to the water, they have to spread their legs as wide as possible. It means it takes a little while for them to get back to a position where they could run or fight back. And this is what makes them so vulnerable. It means they take hours (literally) to walk the last kilometre or so to the waterhole and finally start to drink. The giraffes will walk for a short time then stop still and spend several minutes looking around, surveying the area for movement. They know lions hide in the grass but they also know they’ll eventually make some kind of move that gives away their position. The elephants are the complete opposite. They show no signs of cowardice as they make their way towards the waterhole. They also take hours to make the journey but only because they constantly stop to eat, pulling leaves off trees with their trunks. 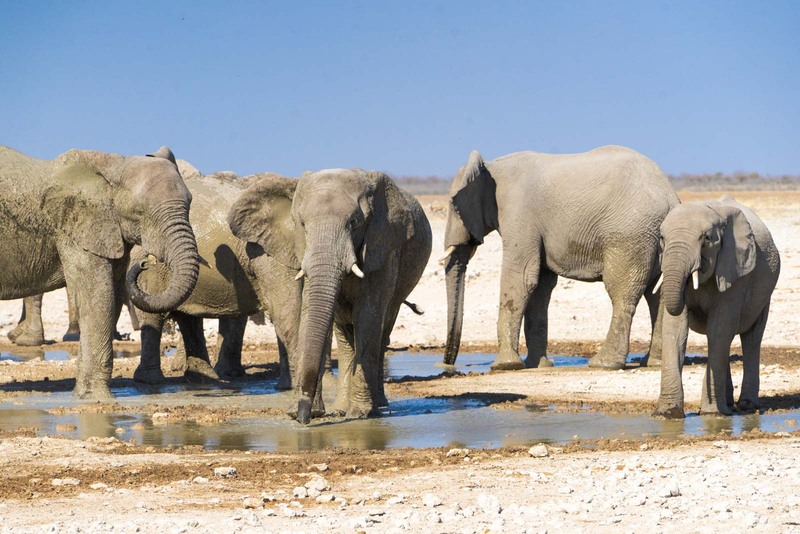 There is no missing the elephants – the majestic giants of Etosha National Park. They travel in a large group of around 20 or so, and lumber along together. I watch them slowly make their way towards water in the afternoon and, as they get close, see the other animals drinking suddenly rush away. I wonder why – the elephants are not predators? Until I see the way that the elephants run the last 50 metres to the waterhole and then throw themselves into the water and begin splashing each other like a pool party. Any other animal still drinking would have been unintentionally crushed to death! And then there’s the rhino. For a herbivore, it sure acts like it is top of the food chain. The rhino does not give a damn about anyone or anything. It bullies its way into the best position at the waterhole, aggressively chasing away other animals that get too close. It’s beautiful to watch. These black rhinos are officially classified as critically endangered but, to them, there is not a fear in the world that they should worry about. When they want to drink, they just go and drink! 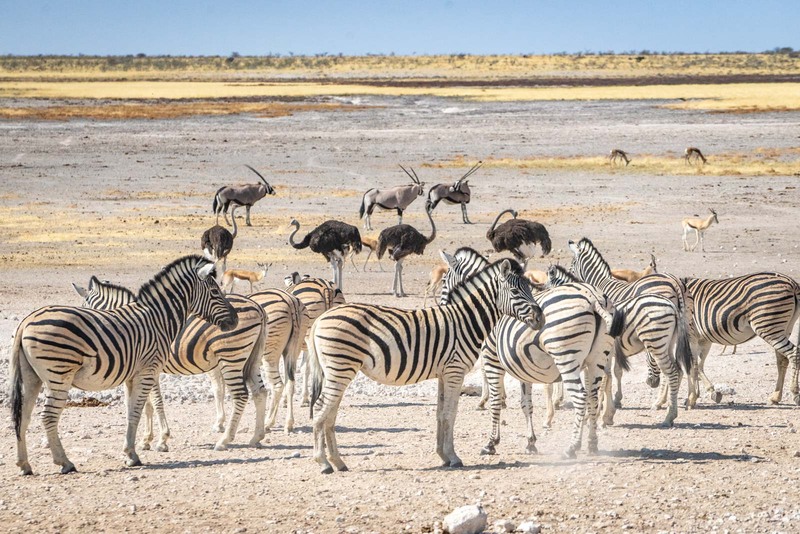 What is Etosha National Park? 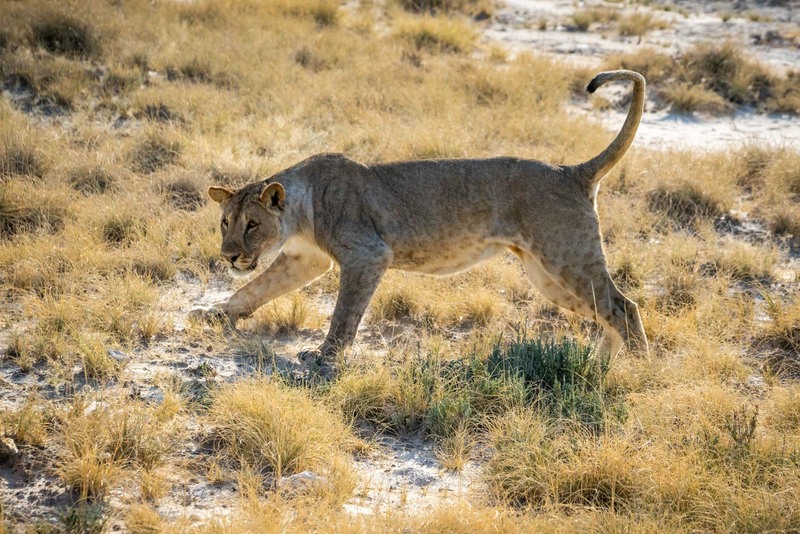 I have come to Etosha National Park as part of my G Adventures tour through Namibia and South Africa. 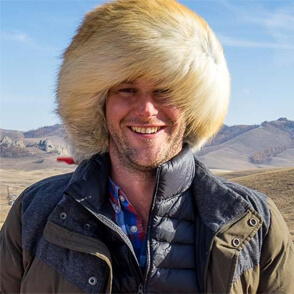 We have already seen some incredible things like the sand dunes of the Namib Desert – but I think this might be the highlight. >> Read my full story about the trip here! 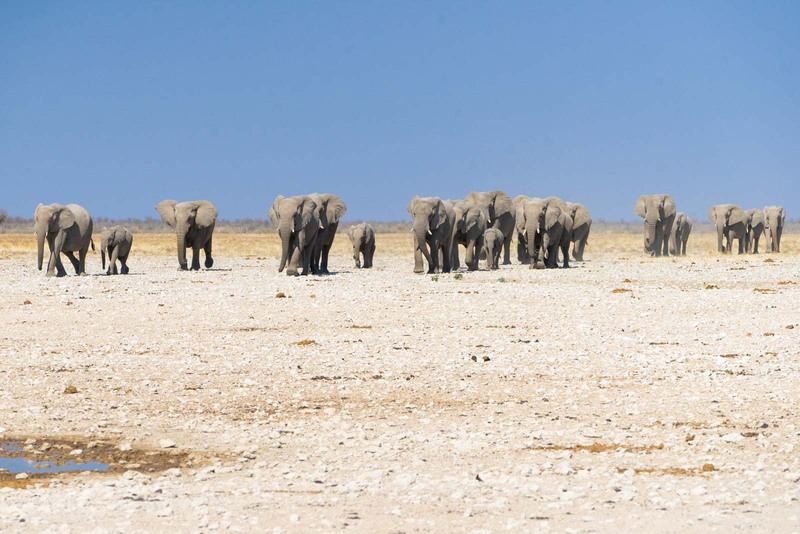 What makes Etosha National Park so special is how close you get to the animals and how many of them you can easily see. This happens for a few reasons. The first and most obvious reason is that there is not really any thick foliage here. 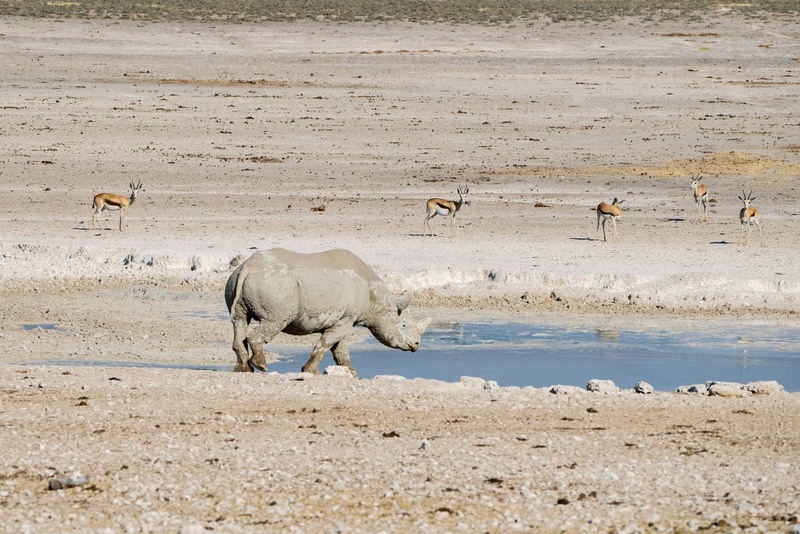 The name ‘Etosha’ means ‘great white place’ and comes from the large salt pan that is within the park. This salt pan (among other factors) means there are not that many trees here and those that do exist are relatively isolated, so you can see for a long distance in front of you. There are also no fields of tall grass so you can also easily see what’s on the ground. But a clear line of sight is not enough. You still need animals to spot. 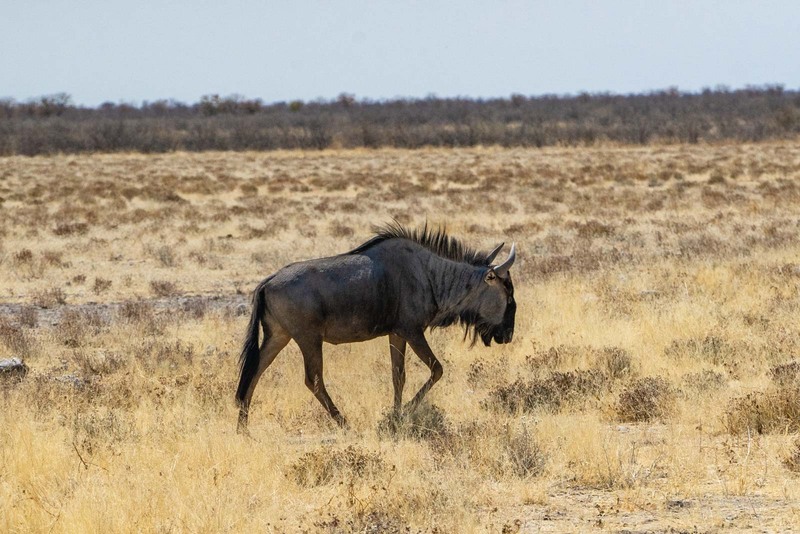 And this is where another of Etosha National Park’s characteristics comes in handy. Because it is so dry, the park managers have created a series of artificial waterholes through the area. And the animals have to come to them. Nothing is guaranteed and the various species here don’t stick to a particular timetable. But it means that if you move around between the various drinking spots, your chances of seeing animals is much higher. With my G Adventures group, we head out on safaris all day long, with a local guide driving and spotting. I don’t have any particular expectations of what to see but if I did, they would have been exceeded. 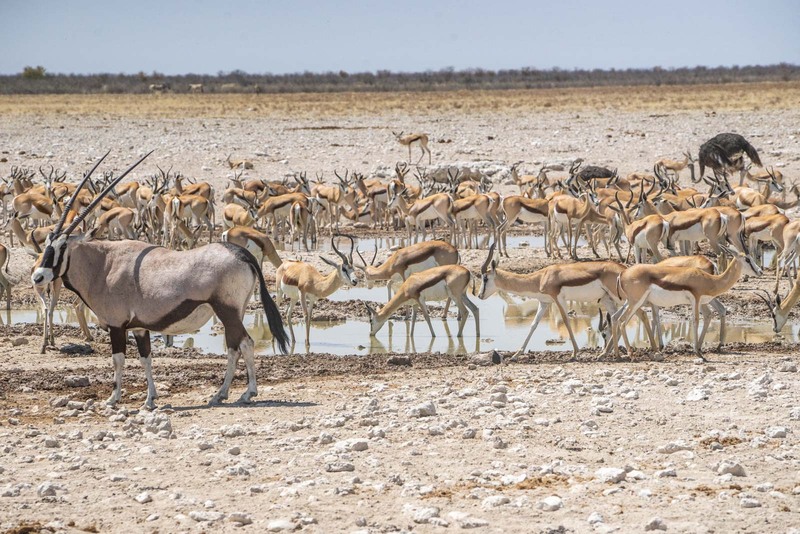 Officially there are 114 species of mammals in Etosha National Park (and, if you’re interested, 340 bird species and 110 reptile species). We see all of the main ones. I’ve mentioned many of the big names already and we saw plenty of them all – zebras, giraffes, elephants, rhinos. 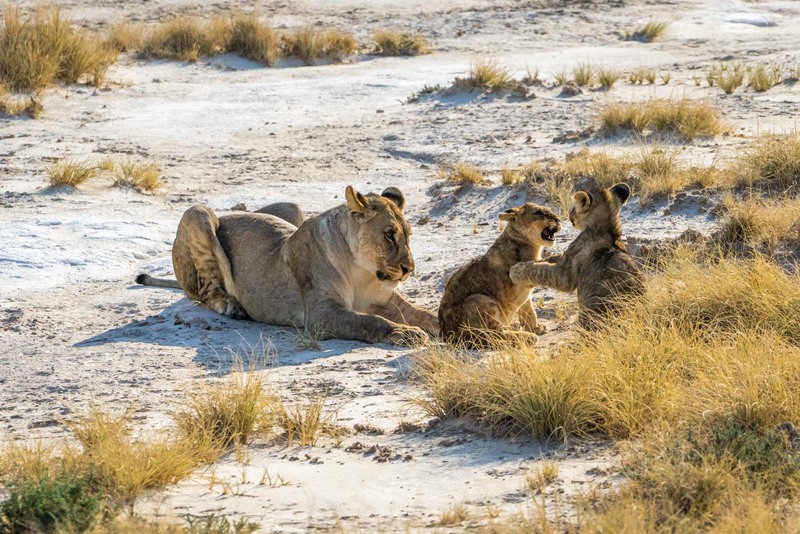 First thing in the morning, we find a pride of female lions who are keeping a watchful eye on a couple of beautiful cubs. And then there are the other animals we spot along the way. 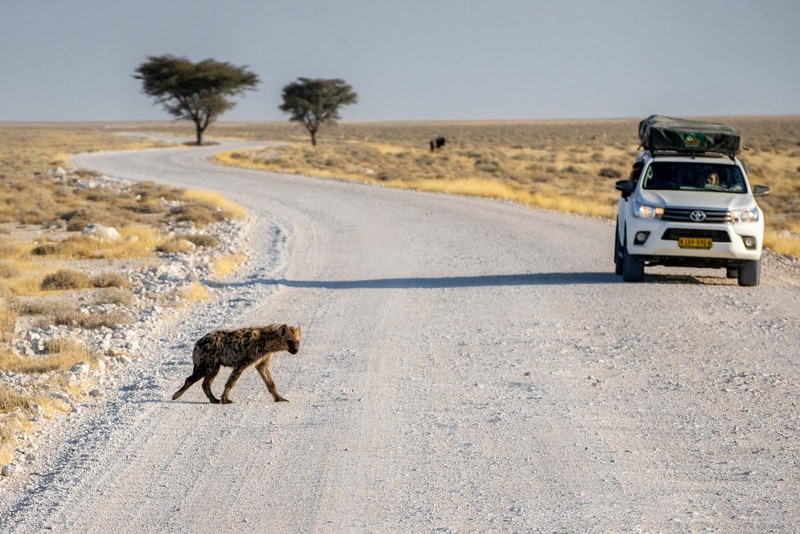 A hyena crossing the road, a couple of jackals, a warthog, and more. There are the herd of springboks, the kudus and the impalas. And the strange-looking wildebeests that many claim are ugly but I think are just misunderstood. We are never far away from animals and as we drive between waterholes, stopping when we spot something, or just cruising slowly among the plains, there is so much to see in this vibrant animal kingdom where an ecosystem is playing out before our eyes. 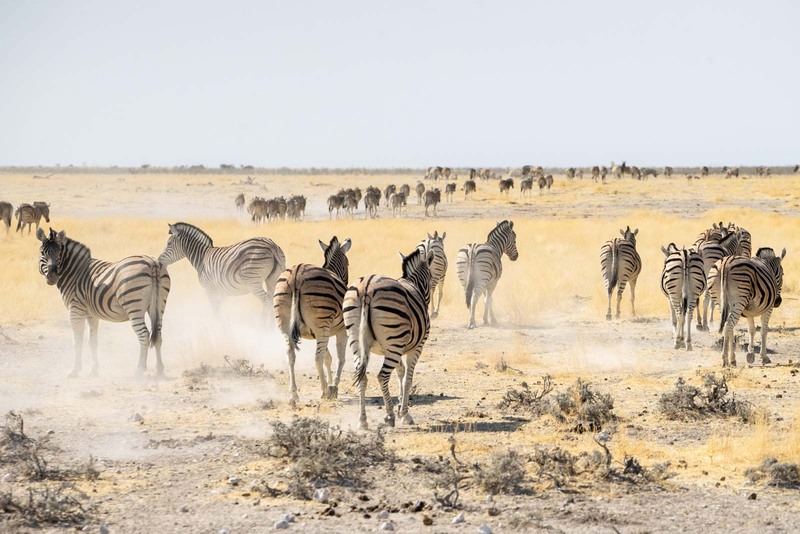 The final thing that I want to mention – that is possibly the most special part of the whole experience – is the accommodation at Etosha National Park. Our G Adventures group is camping in the main camp inside the park, called Okaukuejo. There are other private lodges throughout Etosha but this is where the main park administration is and it has great facilities. But it also has its own large waterhole, right on the edge of the camp, on the other side of a fence (that protects us useless vulnerable humans). 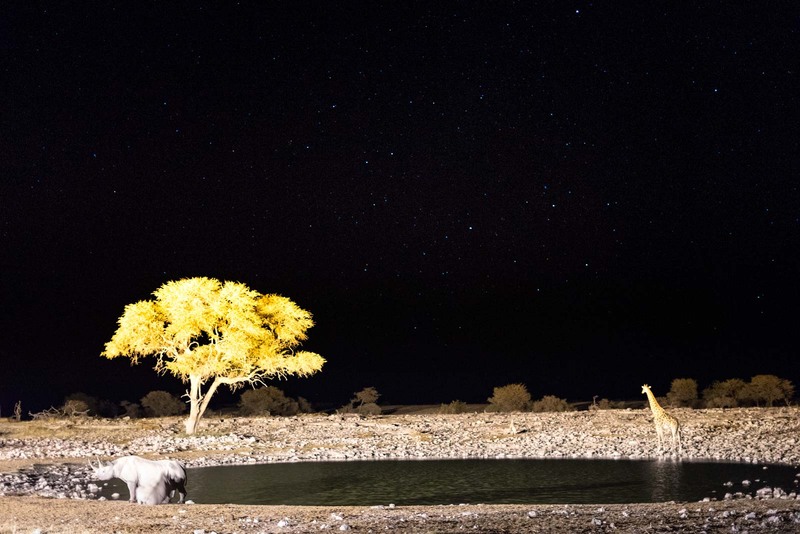 Around the waterhole are seats and at night there are soft lights that shine all the time. And as you sit there relaxing (perhaps with a drink in the evening, if you like), you can watch as the animals all come in for their own drink. And I see so many right here – rhinos, elephants, giraffes, and hundreds of other animals. 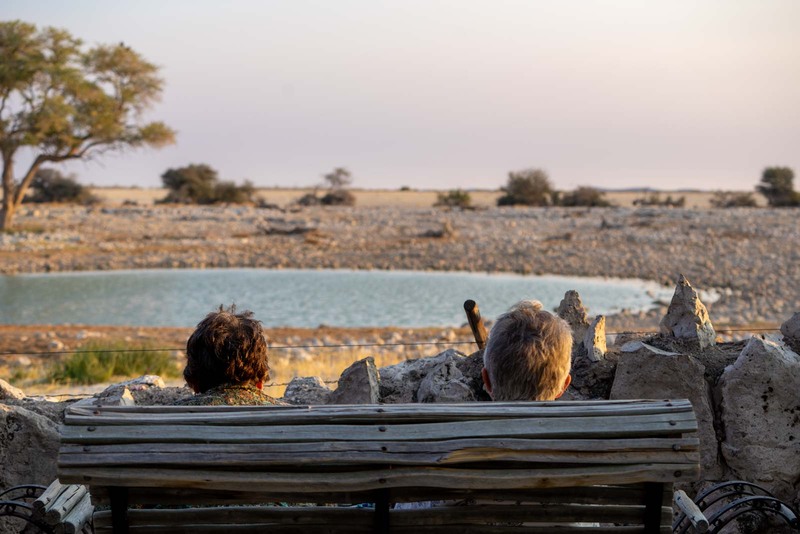 Without even needing to go one metre in a safari jeep, you can see all the highlights of Etosha National park and spend hours in the evening watching it all play out. It’s here that I see the dynamics of the waterhole playing out to its full extent and I see the animals looking around so carefully for predators. But nothing comes to attack and everyone gets a chance to drink and then leave in peace, satisfied and happy for another day. 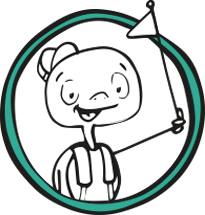 From your story I can imagine that you are truly living a wonderful adventurous life. I really envy you. I wish I could do the same. Every day is an adventure. Never the same monotonous routine. I write to thank you for sharing in such clear details to allow me and others to be there with you in our imagination by reading your well-written article.